Meditation is a great tool that anyone can use to help to relax and stretch. 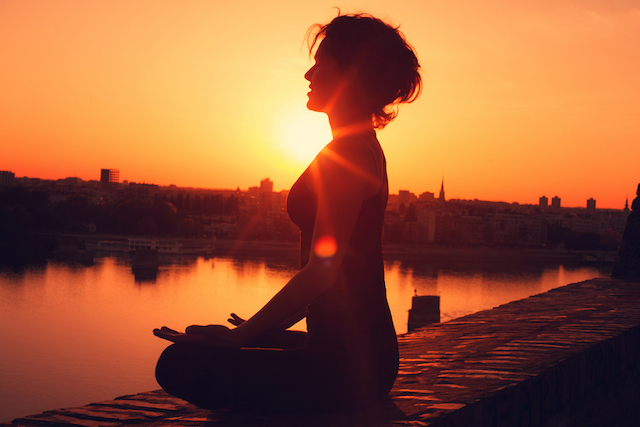 Depending on the type of meditation used, it can be done anywhere. This article will outline the steps someone would need to take in order to achieve basic meditation. These instructions are meant for beginners, so anyone can learn. Go somewhere quiet. Meditation requires focus and relaxation, and that can’t be done unless a person is in a distraction free and stress-free environment. Anywhere that is quiet and calm will work. If a person cannot find a completely quiet area, then listening to soothing music while wearing headphones can also work. Sometimes lighting candles can also help to set the mood. Set up a time to meditate. Finding the time to meditate is one of the hardest parts of meditation. Making time can ensure that a person will not be rushed. If there is not much time in a day for a person to meditate, setting a timer may be useful. Get comfortable. The next step in meditation is just to be comfortable. Sitting on something soft and wearing comfortable clothing are all key to making mediation work as best as it can. Posture is key. Sitting on straight is the most important part. This can be done on the floor, on a cushion, or on a chair. Once sitting up straight, a person can do whatever they want with their hands. However, people should settle on one thing to do with their hands rather than moving them about as they meditate. Focus on breathing. Breathing is one of the most important parts of meditation. Inhale in through the nose and out through the mouth, or the other way around, but don’t switch between the two. The key is to keep the breathing steady and rhythmic. Something counting a few seconds to breathe in and out can help. Breathing to relaxing music is another way to make a meditation breathing pattern. Focus on meditating. One way to do this is for a person to keep their eyes closed. Keeping a person’s eyes closed can help to block out distractions to keep the meditation going strong throughout the session. Keep practicing. Practice makes perfect. Meditation is likely to be difficult at first for beginners. It is hard to clear a mind that is busy with thoughts. It’s best that people take it easy the first time and don’t beat themselves up if they can’t get it right. Meditation is sure to become easier the more times that it is done. Meditation can be done alone at home or with a friend. If a person cannot meditate on their own, using guided meditation audios may also be able to help. Hopefully, this article can also provide some help for those who want to learn how to meditate as well.